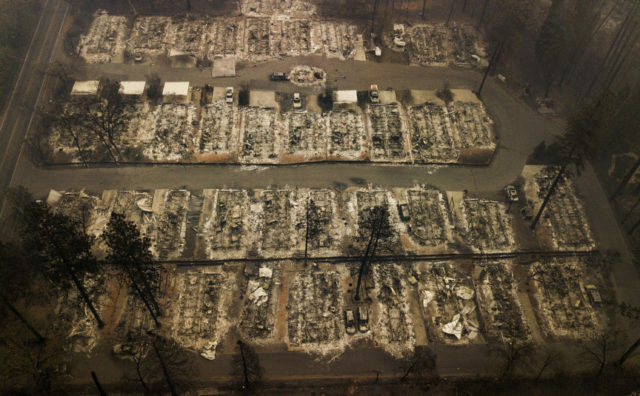 (AP) — Authorities have reported seven more fatalities from a blaze in Northern California, bringing the total number of fatalities so far to 63, while the number of missing people jumped to 631. The announcement came Thursday as authorities continued to search the devastated town of Paradise for human remains. More than 5,000 fire personnel were battling the blaze that started a week ago and has displaced 52,000 people. An informal camp for wildfire refugees in a Walmart parking lot in Northern California is going to be closing. Volunteers who helped bring in free food and clothing said Thursday they are phasing out amenities. Volunteers say they want people to go to shelters, so clothing, food and toilets will be removed by Sunday. Betsy Totten, a Chico city spokeswoman, said it’s unclear what will be done if people don’t leave, but officials don’t plan to kick them out. The site has been popular with evacuees who can’t find a hotel and can’t stay at shelters because they have pets. The White House announced Thursday that it is still arranging details of his trip to California, but that visit people who have been impacted by the fires.